So far we've got three waves up from the low. If the market makes a new high tomorrow we can see a nice impulsive wave consisting of five waves, what should confirm the blue forecast. 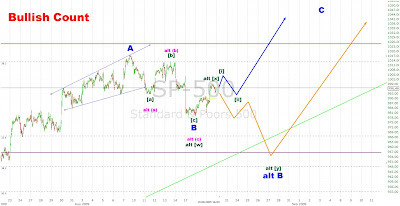 But if the SPX should go below 991 without making a fifth wave before, the orange count would be more likely. Anything below 979 will definitely confirm the orange count.